In this interview, Richard More talks about collecting art glass paperweights, including the history of the Ysart family, other popular Scottish paperweight producers, and the different paperweight designs available. Located in Kansas, Richard can be contacted via his website, Richard Mores Paperweight Photo Albums, which is a member of our Hall of Fame. In 1998, while going through my parents’ estate, my wife and I found some glassware made by Anchor Hocking between the 1940s and the 1960s as promotional items for laundry detergent and gas stations. My parents had recently been killed in an automobile accident, and my wife said, “Hey, it’d be a good idea to try to put this set together in memory of your mother,” so we started visiting antique shops to see if we could find more. We gradually put a set together and found others in different colors with different etched designs. We ended up with about 1,100 glasses. My wife thought I ought to collect something, so I started buying some paperweights. I’d pick up a few Perthshires and Caithness and one or two Baccarats and stuff like that. In June of 1999, I bought my first Strathearn. There wasn’t a lot of information anywhere on Strathearn, so I decided that’s what I would collect. I learned that the father, Salvador Ysart, had four sons, and they all worked for a company called Moncrieff Glass. There’s decent information on one son, Paul Ysart, because he’s acknowledged as one of the fathers of the renaissance of paperweight-making. The various types that he made are pretty well documented, whether it was millefiori or lampwork, flowers, fish, birds, ducks, stuff like that. But there wasn’t much information on the father and the other sons. One son died young back in the early 1940s, and Paul and his father, Salvador, had a falling out and didn’t talk for years. Salvador and two of his sons, Vincent and Augustine, left Moncrieff Glass in 1946 and formed a company called Ysart Brothers Glass. They made paperweights, glassware, bottles, dishware, etc. They signed their glassware items as Vasart –first initials of each of their names (VAS) and the last three letters of their last name (ART). 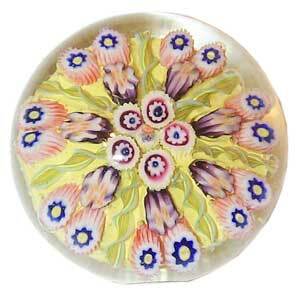 Paul Ysart stayed at Moncrieff Glass and made paperweights, which command a very good price. He never had any association with his father or brothers in their glass working ventures. Salvador died in 1955, and Augustine, the older brother, died in 1956, leaving only Vincent. Ysart Brothers Glass was not very profitable during that timeframe, so they took some financial assistance from a guy that ran Pirelli Glass. Vincent and Pirelli decided to officially rename the company Vasart in 1956, and it ran until 1964, at which time the company was bought by Teacher’s Whisky. Teacher’s Whisky built a new plant and provided new equipment, and they renamed the company Strathearn for the River Strathearn there in Perth, Scotland. Strathearn ran until 1980, at which time Stuart Glass bought the company and discontinued paperweights altogether. When I first started collecting Strathearn paperweights, I really had no idea how many different varieties and designs there were. I figured maybe 15, 20, 30 different types, but now I’ve found up to about 126 different types of paperweights. I had no idea how involved I would get, but I think most collections are like that. You start collecting one or two items, and then all of a sudden you find another branch that ties in extremely well with your collection, and before you know it, your collection just gets larger and larger. I concentrated on Strathearn paperweights, and then I found out that Strathearn was the predecessor of Vasart, which had operated Ysart Brothers Glass, so my paperweight collecting expanded from the 1965 to 1980 and range back to 1946. Collectors Weekly: What made the Ysart paperweights so unique compared to other art glass paperweights? More: I’m not sure they’re necessarily unique. Perthshire was a big company that made paperweights and they were very famous for years. They went out of business in 2001 or 2002 when the son died. Drysdale, the owner and founder of Perthshire, had worked at Strathearn in the early ‘60s. In 1968, he had a disagreement with the management about the type and quality of paperweights he felt that the company could make, so he left and formed Perthshire, taking a lot of Strathearn workers with him. A lot of the people that worked at Caithness had also worked at Strathearn, and then Caithness bought Whitefriars, which was another company that made very similar paperweights. So nothing’s particularly unique about Strathearn other than it just caught my fancy. Companies like Perthshire, Caithness, and Whitefriars signed and dated a lot of their paperweights, and they kept very good records of what they made, when they made it, and the various styles and designs. There was a lot of information about them, so more books had been written about those companies than Strathearn and the Ysart family. Collectors Weekly: Were the paperweights made in Scotland different from those made in other countries? More: Not entirely. The Scottish paperweights just seem much more attractive. I think the design and style and quality of the Scottish paperweights are several degrees higher than those from other places. China had been making paperweights for years, and they tried to copy a lot of the old masters from the 1800s. Italy had been making paperweights for years, too. 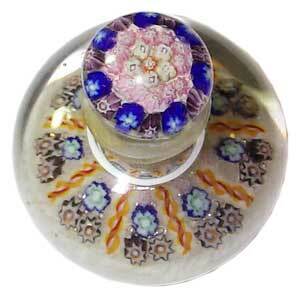 They use what they call millefiori, the little tiny canes inside the paperweight. Some individuals on the island of Murano made very good paperweights, and some just made them for the tourist trade. There were American paperweight makers and glassworkers in the 1920s that were good, and there are some today that are just outstanding. I still just really prefer the Scottish ones – Perthshire, Caithness, Whitefriars, Edinburgh, Phoenix, John Deacons, William Manson, John McDonald, and many others. The interesting thing is that an awful lot of the people that I just mentioned all worked in conjunction or at least in association with the Ysart family at one time. Over the years Paul had quite a few apprentices that he would take under his wing and train. William Manson worked for him for years. John Deacons, who is a very prolific paperweight maker today and has his own little glassworks company, worked for Strathearn at one time, and then he went to work for Perthshire. Unfortunately, a lot of these companies have gone by the wayside over the years, either because the owners died or the company went bankrupt. A lot of the individuals who mastered the art of glass working formed their own companies, like John Deacons did. Collectors Weekly: Do a lot of collectors collect just the Scottish paperweights? More: Most paperweight collectors collect what they like, not exclusively one company. 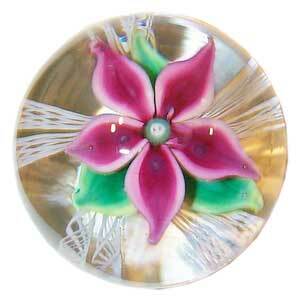 So many companies and individuals made beautiful, striking paperweights. When I search the Web for paperweights, it’s difficult not to want to venture out and buy some by other artists because they’re terrific paperweights. But at the same time, my own collection just of Ysart family paperweights is getting quite large. And even though I’ve been doing this for about 10 years, I still don’t have an example of every design they made. Some I haven’t even seen. I know they’re out there because I’ve seen pictures in books of them, but whoever owns them is not selling them or at least they’re not selling them on a venue that I can find. I always introduce my collection as Strathearn because that’s primarily what I collect, from 1964 to 1980, but I also have a decent representative sample of the Vasart period from 1956 to 1964 and a few from the Ysart Brothers period from 1946 to 1955. I don’t have a lot of them, because they’re getting to be relatively expensive. I felt that I needed to concentrate on one area. If you see a paperweight that is outside your main collecting realm and you buy it, one of the ones that you were looking for in your main collection shows up, and you say, “Where am I going to find the money to buy that?” So I found that I have to be a bit careful because there are a lot of them out there. 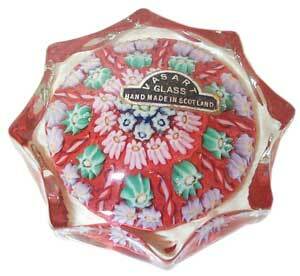 I think Perthshire probably made close to a million paperweights during their company’s lifetime. The Ysart Brothers made considerably less, but even so, you’re talking 200,000 or 300,000. There are just tons that I pass by, simply because nobody can afford to buy them all. Collectors Weekly: Why do you think the Ysart family didn’t keep records? More: I don’t really know. As far as production quantity, I don’t think any of the Ysart family’s ventures were nearly as prolific as some of the larger companies like Caithness or Perthshire. Those companies documented their production very well. I’m not sure the Ysart family was ever hugely profitable, and for whatever reason they just decided that brochures were not that terrific a thing. They might have thought, “Who would want these things after they’re out of date or we come up with the new ones?” So the documentation wasn’t saved. Strathearn also made what they called upgraded paperweights, which were a little bit better than the run-of-the-mill tourist type that they would sell or consign to various department stores. One of the guys I talked to who worked for Strathearn at one time said they had salesmen who would go to the upscale department stores like Harrod’s to sell the company’s paperweights, so they had to have some brochures or catalogs that would show pictures of them. For years I have searched, but I will probably never in my lifetime find a brochure or a catalog from the Ysart Vasart period, and nobody else will either. I don’t know – and I’m not sure anybody else knows – what was the earliest year Strathearn produced a color-type brochure or catalog. I have several copies of brochures from the 1978 to 1980 period. I bought a paperweight earlier this year from a lady who happened to have two brochures from Strathearn, and when I bought the paperweight from her, she sent them to me. Strathearn gave them to people who went into their shop or tourist areas to buy paperweights. Collectors Weekly: Were all of the paperweights they made different? More: When you’re dealing with glass, no two items will be absolutely identical, but you may have a run. They’re similar, there might be tiny variations because each paperweight was individually made. These things were not mass-produced on an assembly line. You have one or two men working together, handling the hot liquid glass. They set the canes or the lampwork in a particular way on a molten glass base, and then they add more molten glass to it until they get the paperweight size that they’re looking for. From an arm-length distance, you can look at them and say, “Yes, these are all basically the same,” but upon closer scrutiny, you can see minute differences between each and every one. Strathearn had a limited-edition series where they made 100 paperweights in a particular style or design, and that was all that they would make for that particular year. The next year, they would make another hundred in the same design and style, until they decided to discontinue making it altogether, but obviously if it was signed and dated, it would be dated 1973 instead of 1974. Strathearn’s regular spoke design, or cartwheel, has a bunch of canes on the inside and then it has strands that divides it up into orange segments. That was pretty much a standard workhorse paperweight. You can look at a hundred or a thousand and the design is all basically the same, but what has changed on the inside would be the number of canes, the particular style or design of a cane, whether it was ribbed on the outside or had serrated teeth on the inside, different colors, different internal inserts. Collectors Weekly: Did they differ from era to era? More: No. If you took a cartwheel paperweight from the Ysart Brothers period and then you compared it with one from the Vasart period or the Strathearn period, it’s going to be a cartwheel paperweight. What’s going to change is maybe the color of the base, the dimensions of the paperweight between height and width, the types of ribbon twists or strands that they use inside, the base, the structure of the glass cane, etc. In 1977, Strathearn made a paperweight to commemorate Queen Elizabeth’s birthday. It’s designated as an EIIR-77. It has one little orange and white cane that has EIIR on it, and another cane has 77. There’s no information on how many they made them, but they’re all basically the same type: a clear glass paperweight with a thick base cushion and two canes, orange and white, and then some other canes sporadically. I have not found any two EIIR paperweights where the same exact canes were used and placed in the same place within the paperweight. Every one is different. Collectors Weekly: The canes are the designs on the inside of the glass? More: Yes. 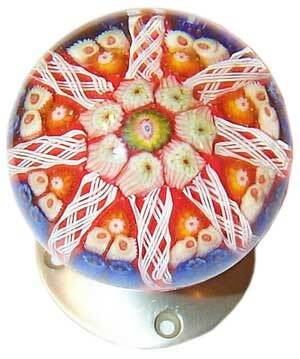 If it’s a flower or a fish or some other motif like that, it’s called lampwork. They make those first using a little Bunsen burner. Once they have that made, they make the paperweight, and then once it’s cooled at least a little bit, they set the lampwork item in it. Then they get more liquid glass to go on top of it and they layer it until they get the size that they want. When you look at some of these, the crystal clarity of the glass is amazing – no bubbles, no striation, no nothing. It’s like looking through a window from one side to the other, and there are absolutely no imperfections whatsoever. I have paperweights that weigh as little as 3 ounces, and I have one Strathearn magnum-type flower paperweight that weighs almost 7 pounds. When you’ve got a metal reach rod, you have to stay at least a few feet away or the heat would be too intense. They use the metal rod to reach in and they twirl the glass to form a ball, and then they have somebody else ready with the millefiori canes set up and a little metal container that they put on the molten glass once it’s cooled down to the level where it’s malleable enough to work with. You can’t leave it in too long because the design would melt into the molten glass. It’s quite a process to make a paperweight. You see the Disney guys, they just take a little blow tube and they take a little bit of molten glass, and they blow it into the design with the little tools that they use to work in. This is not the same. A lot of people have advertised that paperweights are mouth-blown, but they’re never mouth-blown. They’re all handmade. Collectors Weekly: Did they mark all of the paperweights with names, like EIIR? More: No. Many are not marked in any way. For the earlier ones from the Ysart Brothers period, the names were derived from the information we have from other companies’ paperweights. Perthshire made a spoke paperweight, or cartwheel. If the Ysart paperweight looks relatively similar, we’re going to call it a spoke or a cartwheel-type paperweight, too. Some companies have a particular designation if they kept meticulous records of the paperweights that they made over the years. Strathearn also had a numbering system to designate their particular paperweights. They had a P-1, which they called an ice pool. It was a piece of white Scottish granite encased in clear glass. It looked like a piece of ice floating in liquid water. Then they had a P-2, which they named the Stoer. It was basically a bunch of Scottish quartz in sand that was layered to form a base with clear glass put over the top so that when you look at it, it sparkles. Then they had the P-3, which was a different type of paperweight, and the P-4, which they called an orchid. You can call it any number of flowers, but Strathearn for whatever reason called it an orchid. It was basically just the head of a flower with the petals coming up into the paperweight, covered in clear glass. They made them in blue, turquoise, and various shades of red. Not all of them came out red; some of them were pink. I’m sure that the Ysart period had a similar designation on theirs. We can look back and say that if Strathearn named theirs like this, it’s probably somewhat safe to say that it could have been the type of designation for the Vasart paperweight, too, because many people that worked for Vasart were now working for Strathearn. But, again, nothing’s etched in stone. Collectors Weekly: How do you determine which paperweights you’re going to collect? More: That’s tough because I want to collect them all. I look at a particular category. For example, Strathearn had a paperweight they designated as a P-10 and classified as a limited-edition and upscale paperweight. It was a cartwheel or spoke-type paperweight, but it was a little better made. It was always signed and dated, and it’s one of the paperweights they would earmark for sale not only in their shop but also to other retailers like Harrod’s or museum chains in the United Kingdom and Scotland. They made them over a number of years, so I have them signed and dated from 1969 to 1979. While they’re all cartwheel spokes, if you try to collect one from each year, each one that you collect is going to be different. You have one that has an S cane for Strathearn, and it’s going to have another cane that says 69. Most times it’s very rare to find one that has a four-digit cane, like 1969. You could collect all nine or 10 years that the company actually made them so that you have an example of each one. Collectors Weekly: How many different designs do you think are out there? More: I think I have 126 categories on my site to date. According to their catalog, Strathearn had a production schedule of paperweights. In other words, they’d make so many P-1s, so many P-2s, and so many P-3s. Then along comes lunchtime and everybody goes off to lunch, but one guy finishes lunch early and he’s got half an hour or 45 minutes left. There’s molten glass sitting in the furnace and there’s some extra canes lying on the bench, so he makes what is called a frigger, which is not a regular production-run paperweight. It’s something that the individual made on his lunch hour or after work if there was a batch of glass that was left and management didn’t mind. They made them for gifts or to sell on the side and make a little bit of extra money. So friggers are excess production, and they’re another whole realm of paperweights within the Strathearn paperweight collection. You might find another cartwheel spoke-type paperweight or another flower paperweight, but it’s significantly different because it was made by an individual who maybe wanted to add his own little twist to it. The thing that makes the collecting so fun and exciting is the unknown. You just don’t know what you’re going to run across. 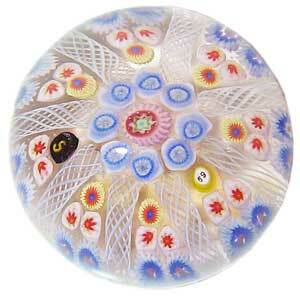 Collectors Weekly: Are there different categories of glass paperweights? More: It’s just the way they’re made. With Strathearn, their cartwheel or spoke-type paperweights were really their workhorse paperweights. It’s one that they made a lot of. They made as many as they could sell for the general tourist trade. It didn’t necessarily have a lot of quality, but it was a nicely designed, good-looking paperweight. It didn’t have too many bubbles and none of the glass was cracked inside. It’s a standard spoke or cartwheel type, and they had the number of spokes run anywhere from five to 12 with canes in a space between each of the spokes. It’s almost like a cartwheel on a wagon. A lot of these guys would experiment with various types of paperweights to see what designs they could come up with. They might be working with the cartwheel spoke designs, but they used a different number of canes or different color combinations that were out of the norm from what the company normally ran for that production. Most of the friggers were of the millefiori type, not necessarily the cartwheel type. They could be concentrics. They could be miniatures. They could be stars. Do they fit into any particular category? If the design is a cartwheel then, yes, they will fit into the P-7, the large paperweight, or the P-8, the medium-size paperweight. By looking at a good random sampling of Strathearn paperweights, you can say, “Yes, these were all production run, but this one doesn’t fit in there.” It’s still a cartwheel, and it’s still a Strathearn, but I’ll bet you a dollar to a donut that this one was made during somebody’s lunch time, because it’s materially different in design than the regular production run. The designs all have different names. You can have an ice pool. An aurora. A store. An orchid. A miniature star concentric, or a miniature round concentric. You can have a cartwheel. You can have a lace of paperweight. Strathearn, Perthshire, and Caithness, like a lot of companies, have multiple styles of one particular design. In other words, for the P-10, Strathearn also made what they called a PP-10. It was the same style of paperweight, dated and signed the same, except the top was faceted so that you could stand it on its side. Then Strathearn took that into another design within that category that they called a PSF-102. It was the same weight, made the same way, signed and dated, except now it was faceted on the top and the sides. Each category is significantly different, and you can’t lump them all together into one because they have different attributes that make them special or unique to their own category. Collectors Weekly: Were the paperweight companies commissioned to make other things, like doorknobs and barware, or did they do that just for fun? More: A lot of it was probably done for fun, but a lot was done for commissions. They would have a particular distributor or company that dealt primarily in barware, bottle openers, corkscrews, long spoons, letter openers, things like that. As far back as the Ysart Brother period in the 1940s, they all made these, and they would primarily use the miniature paperweight, under 2 inches and typically about 1 1/2 inches in diameter by maybe 3/4 inch tall. They’d just glue it to an item or, in the case of a can opener or a corkscrew, a small hole would be drilled in the base of the paperweight and it would be glued on. They made gear knobs for the stick shift in automobiles, and those would be glued on. Some of these were made for fun and some were for gifts. The more valuable ones, if you can find them, are the sets where they might have used the claret spoon. They have the bottle opener, the can opener, the corkscrew, and maybe a jigger. That is one of the Holy Grails of collection items to find. Each of the paperweights would look very much the same. They would have made seven that would be closely resembled and they would use all seven for various items, so you’d have a matching set. What makes it particularly nice is if you can find the original box they came in. There are several of them shown on various websites, although I don’t have one I could show. They’re very hard to find. Unfortunately, the box rots after a number of years and falls apart, and some of the individual items are lost or broken or they end up getting sold and separated. It’s quite unique and difficult to find a complete set in the original box, but they are out there. It’s like the paperweights for Strathearn, the overlays. An overlay is basically the same paperweight that we have been discussing, but with a special cup with a color in it. It could be blue, red, yellow, lime green, purple; or any combination. They dunk the paperweight in, forming a glass coat around the clear glass paperweight. They would do this several times, and then they will facet the top of the sides and stuff like that so you can actually see inside the paperweights as to what the design on the inside was. These are called overlays. I have examples on my site, too. If you scroll down far enough, you’ll get into the PF, FC series galleries that have examples of the overlay flower, the overlay P-10 or millefiori cartwheel type, the overlaid butterfly, the overlaid lace, the overlay crown and items, paperweights like that. Those are extremely rare. 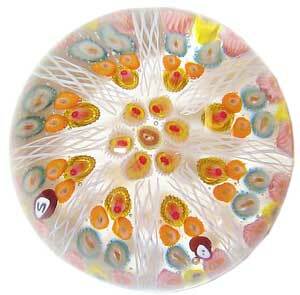 Collectors Weekly: Can you suggest any good resources for potential collectors researching glass paperweights? More: Almost every state has a paperweight collectors club, and a number of countries have multiple clubs. How many paperweight collectors are there? I don’t know, but I’m sure that they’re all over the world. I do a lot of my research online, and I also learn a lot from the brochures and catalogs that I have. I talk to guys in the U.K. whenever I can. In terms of books, Colin and Debbie Mahoney and Greg and Marge McClanahan put out a book called The Complete Guide to Perthshire Paperweights. It covers a wonderful introductory description on the company and the procedure. They actually show the furnaces. And they show how they make the designs, how they’re set in the little trays, and how they actually pick up gathers of liquid glass to polish the paperweight. It covers every paperweight that they made from 1968 up to the date that this book was printed, which was the late ‘90s. Robert G. Hall is a very prolific author, collector, and seller of paperweights – not just Scottish paperweights, but all kinds of paperweights. His Scottish Paperweights is printed by Schiffer Books for collectors. It has an introduction, and then chapters on making paperweights and the companies that made them. These guys, like Robert Hall, spend years on this, and they know an awful lot of the guys in Scotland. They interview them and take pictures of the paperweights, and then they put out terrific books for collectors. These are the type of books that collectors want to buy because there’s just so much helpful information. Monika Flemming and Peter Pommerencke wrote Paperweights of the World, and then there’s another one by Bob Hall, Old English Paperweights. This goes back to the period before the Ysarts, paperweights like Bacchus and Whitefriars. Collectors Weekly: Any other advice for somebody who’s just starting to collect paperweights? More: Don’t necessarily go for the cheapest; definitely go for something that you find appealing. They’re aesthetically pleasing to look at. I can’t see collecting something that you don’t like. Definitely buy something that you like. If you happen to get a good price, great, there’s nothing wrong with that. It’s hard to put a dollar value on it because you might be able to pick up a beautiful Perthshire or Caithness for $5 or $10 when normally it would cost you $50 to $70. But, by all means, if you want to collect something, collect something that you like to look at; something that you like to have. Collectors Weekly: Thanks so much for taking the time to talk with us. I have a blue swirl paperweight with the name “RED” on the bottom. Do you have any information on this? I own one Strathearn paperwight, received as a gift in 1978. 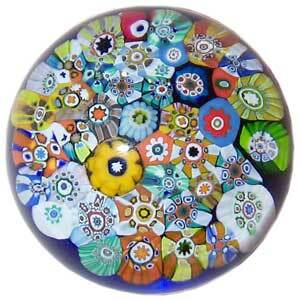 No marks, millefiori-style, approximately 2½ inches in diameter and eight star-shaped. It is in its original lined blue hinged-box. Is it worth anything? does your “pontil stamp” have lines both sides of the RED – making up a key? If yes – your weight will have been made by Max Miller of Redkey, Indiana. Can you lead me to something to give me history of Max Miller paperweight? Max Miller was a friend of my parents. I believe the last time he fired up was in 2004 (he was around 83 at that time). We were fortunate to be able to collect samples of many of his paperweights and a few birds which he called his “bread and butter”. He sent small clear glass birds and cobalt ones in egg cartons to souvenier shops all over the U.S. but these didn’t bear the Redkey stamp. In his private collection he had larger birds, including a bright red cardinal. He was a great recycler of glass, especially cobalt and brown beer bottles. Not all glass is compatible or recyclable but Max knew his stuff. He worked occassionally in glass factories around Indiana, including Indiana Glass in Dunkirk, IN and I believe Ball Brothers, which once had subsidiary in Redkey, IN. But Max told me he hated unions and would only work for 30 days, because on the 31st day one had to join the union in order to continue at the glass factories. He made his living as an organ tuner, travelling all over the U.S. refurbishing and tuning some of the bigger pipe organs. His lovely bride of more than 50 years, Kitty, told me he married her because he needed someone to hold down the keys. Together they built a home and studio on the eastern edge of Redkey, and also had a small sales building for Max’s creations. The house was snug and cozy inside, of cement blocks and what looked like factory windows from the 40’s. Kitty liked to laugh about the window replacement salesman who dropped buy to try to sell them ‘modern’ windows. “What, you want us to dismantle our house?” she asked him. The window sills were deep and south facing ones made beautiful display spots for Max’s more spectacular pieces. Kitty rotated her favorites on the mantlepiece, lighted from beneath by small Christmas tree lights inside wooden bases, which I think Max may have designed. Though not tall in stature, he and Kitty seemed able to make anything that they took a notion to design and build. I feel lucky that I got to visit them with my folks. They harkened back to a time when people were self-sufficient, tough in a quiet way, with Hoosier humor and a kind of pride that is neither egoism nor selfishness. Max was a funny guy and Kitty kept right up with him in the kind of way I’ve rarely seen, because they were still so in love with each other, looking out for each other. If you have one of Max’s paperweights, you have something rare on many levels. Some of the glass inside was remelted from the slag heap at the edge of Dunkidk, where we used to play as children. A lot of kids from that area fell in love with glass after first standing at the edge of acreage where the glitter in the sunlight on rainbows of color made you think you were at the gates of heaven. These comments & questions are for Maribeth Keane and/or Richard More and are sent 06/24/09. Thankyou for review of same & whatever response. the field. It was entitled “Green Cloisonne” by the dealer’s shop label. It is 3″ dia. x 2″ ht., and is 5-sided with facets on each side and facet on the top. It is a clear weight encasing a 2″ dia. green interior dome, which has 8 latticino spokes separating 8 small outer areas of: 2-blue then 2-small white then 1 pink millefiori canes in each outer section. Inside of this outer section is an inner circle of 7 white millefiori canes which encircle a larger white center millefiori cane. Question 1: who might the artist have been in 1979 at Strathearn for this p/wt? Question 2: Might there have been a brochure or catalog for p/wts made in 1979? As I said, it’s my first Strathearn wt. and reminds me of similar millefiori p/wts by Perthshire. Many thanks for posting yr “Collector’s Weekly” Interview of January 2009.
collection was created by Baccarat. I wonder if it is real or not. Can you somehow guide me. Thank you. I have a glass/crystal bottle stopper that actually looks like a paper weight. Just like the picture above -1980 Strathearn canes- and in one of the tiny flowers is the letter P in dark blue. Can you tell me who is responsible for this marking? Great article and interesting post on Max Miller. Thanks to all involved. I also would love to see the responses to the questions posted here to learn more. p.s. Are “end of day” weights friggers? I was cleaning out a house and found a paperwight and was wondering if it has any value. It appears to be art glass with “wiggly” lines going across it. It has white harts. It is difficult to read the signature. It appears to read: richarosm 85 with an intial. Any information you can give me will be appreciated. Thank you. Janna asks … Are “end of day” weights friggers? “End of day” is an ill-defined term – and unfortunately very often used for all sorts of paperweights. Strictly “end of day” would denote paperweights made from just left over canes or glass bits at the end of the working day: “scrambled” weights may have started out this way – but later were made by design and in large numbers – so I would not call them “end of day”, implying a somewhat arbitrary “design” – well – not really any design. So in this sense “end of day” weights could very well be “friggers”. Unfortunately, if you follow ebay, you’ll find “end of day” used for just any type of paperweight – scrambled, concentric cane setups, lampwork, abstract, …. which is why I recommend to just forget this term! Edinburgh (better Edinburgh Crystal) never made millefiori weights themselves – but commissioned some. In 1986 a whole series was made for them by Caithness – see http://tinyurl.com/scotlandsglass-EC-paperweights (sorry – some images are rather poor – better ones are in the queue). These were etch signed “Edinburgh” on the base. Is yours one of these? Later EC likely decided these Caithness weights were to expensive for their market segment – and imported Murano millefiori weights instead – marked as “Edinburgh International”. I have a Phoenix Paperweight (signature cane PP but etched Phoenix). I have been able to do very little research on this small business and now defunct company. How unusual is it to find one of these weights ? I have a paperweight that was advertised as a Strathearn, but the bottom has been ground completely flat, which makes me think it is more likely to be a cheap knock-off. On the other hand, we have a Murano that has a ground bottom. Does the flat bottom indeed mean it is not Strathearn? Is there any other way to determine its provenance? to #18 Lorne says….Your paperweight may well be a Strathearn weight. Strathearn workers often finsihed off to a flat base many of their paperweights and these flat base weights were not limited to a particular catagory of weights made. Without actually seeing the weight in question it is a bit difficult to say for sure 100% but may I suggest that you visit my site at http://www.strathearn.smugmug.com , take a look around at the various galleries to see if you can find an example of your weight and then get back to me. I was given a paperweight that is shaped like a modern Xmas tree. A round ball on top followed by four flat plates small to larger with a large ball base. It is signed I cannot descifer the signature. It is a beautiful emerald green. I bought a millefiori vase as the one displayed here in the video http://www.artweshop.com/home-decor-millefiori-imperio-rossi/ however I am a bit confused after reading your article. Is the millefiori technique something belonging to Venice or it’s a common technique among glass producers? How can I recognize that it is not an imitation? Strathearn Glass was located to the south west of Simi Valley, California in an area that is Wood Ranch today. The Glass Works shutdown in the mid to late 1960’s, many artisans moved to Scotland after the glass works closed. Strathean Glass was part of Strathearn and Company which included Strathearn Steamship, Strathearn Mining, Strathearn Cattle, and Strathearn Savings and Loan, my grandparent’s companies based on my understanding. I received a lovely paperweight signed Bennett 1973. Can you help me find some information on this artist. Thank you very much for all the info. I just love paper weights! Maude and bob st Clair and Joe Rice, Joe StClair Baccarat, Moranno from the first one I purchased and I also still keep a keen eye out for some of these beautiful pieces of fantastic works of art. Thank you so much for the pain staking work you have done here! Your collecting friend. Strathearn Glass was South West of Simi Valley California in what us today Wood Ranch. It was there until 1967 or so when the artisans left and traveled to Scotland. They setup shop there and began producing decorative art glass in Scotland soon after. I was present when the artisans were preparing to move and was required to witness the actually building being moved with my wife Tina. My grandfather was busily helping the artisans get savings with the Savings and Loan. Strathearn Glass was part of Strathearn and Company. “ ” If there’s blood on the sword and you start polishing it, the sword bleeds.